Doors - 7:00pm // Price - £13.00 Adv. Soup was founded in 2004 by Trondheim based multi instrumentalist Erlend Viken. After the starting years Viken teamed up with his childhood friends, and former members of the metal band Klompfot. Drummer Sverre Leraand, Bass player Rune Leraand, and guitarist Ørjan Saur set to interpret and translate the previous material for a live format, as well as working on new material for the upcoming Children Of E.L.B. album. Although the E.L.B. album is written by Viken, the mere collaboration of the four members helped give the album a more lively and organic sound than the previous albums. Joined also by Motorpsycho guitarist Hans Magnus Ryan as co- producer, this release sets a new standard, and also elicits a lot of positive attention for the band. The Norwegian ABC News awards it the “album of the year”, as the four piece starts touring the Norwegian scene. After playing various festivals in Norway, as well as supporting the slightly legendary Maserati at Kampen Bistro in Oslo, the members part ways in 2011, and a new constellation is set to continue the band. With Guitarist Ørjan Langnes, bass player Jan Tore Megaard and drummer Thomas Nyborg, Soup starts working on their fourth album, The Beauty Of Our Youth. The faithful “Souporter”, and Danish photo artist Lasse Hoile, following Soup since 2006, continues his work with the band. After shaping the visuals of the E.L.B. album, the audio visual bond is further strengthened with the layout of the Beauty album. As opposed to the previous albums, The Beauty Of Our Youth is not mixed by Viken, but by Scottish producer and musician Paul Savage in Chem19 Studios, Glasgow. In between the recordings of The Beauty album, Viken also records and produces the albums DUUN and Entropia, as well as releases two compilations of various sketches and demoes. Soup opens for Swedish prog legends Opeth at Studentersamfundet in August 2012, and they embark on a Greek/Turkish tour in March/April 2013, playing several shows in both Athens, Thessaloniki, Ankara and Istanbul, including a live performance on the Greek TV show Radio Arvila. The Beauty album releases in September 2013 and receives several great reviews in both Norwegian and European press. 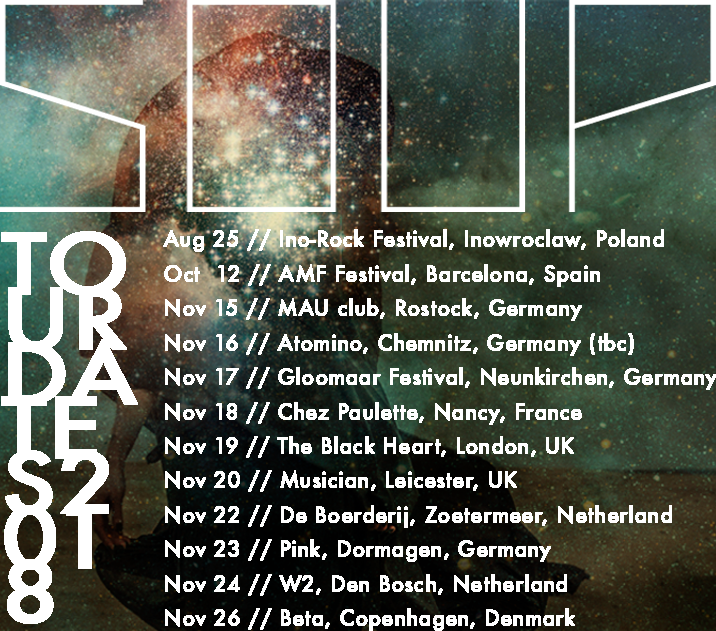 Early 2015, Soup joins stoner rock newcomers Spidergawd on their European tour in March 2015. After the European tour in March, the band takes a recess before starting to work on the material for the upcoming album. This time also in collaboration with Paul Savage (producer known from his work with Mogwai, Franz Ferdinand) and Lasse Hoile, recorded in Namsos RC Studio, produced by Paul Savage and Soup. During the 2015 Spidergawd tour, Soup is signed to Crisping Glover and Stickman Records. In 2017 they release the new album Remedies. This album received a lot of raving reviews and become a favourite of many fans and even of musicians like Steven Wilson. It raised the interests of promoters and eventually as well Glassville Music, where the band signed a management and booking deal. The album found a prominent place in many top album 2017 yearlists. The band is now in the process of recording a new album. And for the coming months will do different festivals and a tour in November 2018.